Winnipeg’s annual winter pop-up restaurant, RAW: Almond, will soon return to its home on the frozen Red River near the Forks for a fourth time. The restaurant’s creators hold a competition judged by a jury of their selection to determine the restaurant’s design every year and this year, three recent graduates from the U of M’s faculty of architecture had the winning idea. The design team – Et Cetera Projects – won with a simple concept that an artistic rending revealed to be a nondescript , long, and rectangular structure with a low roof, similar in appearance to some Nordic mead halls . It appears that patrons are to enter through the structure’s side, using an elegant entryway that curves along the river’s bank. 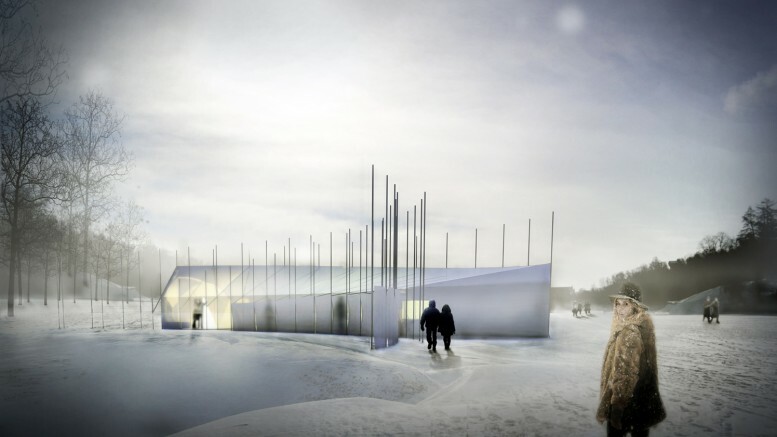 The restaurant will be erected at the Forks on the frozen Red River for three weeks, from Jan. 21 to Feb. 14. RAW: Almond was conceived in part by Mandel Hitzer, chef and owner of the open-year-round Deer + Almond. The menu of Deer + Almond lends heavy preference to seafood with tuna carpaccio, smoked goldeye, and salt & pepper squid being among the main dishes. RAW: Almond however, will likely be subject to more variation, as Hitzer has brought in a litany of additional chefs from across Canada to contribute to the wintry fine dining experience. The individual members from the winning design team have worked together in other groups on several competitions, but as a three-member team, this is their first competition entry and win. Et Cetera Projects takes their name from a zine made and distributed by other architecture students at the U of M known as Et Cetera. The zine has made three small issues to date, and publishes the progress of student architects and designers as a casual and accessible way for them to present their work throughout the year. “The intent of the publication is to cross over design with other things […] including arts and architecture,” Et Cetera’s co-founder, Mundle told the Manitoban. McGinn said the exposure that Winnipeg has gained from RAW: Almond and similar projects done on the river has brought design to the forefront in the city. “When it comes to RAW: Almond, people are going there for dinner, but now slowly they are becoming more and more aware that it’s also an architecture thing,” McGinn said. The designers’ experience with the restaurant in past years was useful in conceiving a winning design. “We knew what worked and didn’t work going to the restaurant in past years, so that’s the angle we took designing it,” said Mundle. Avoiding over-designing was also a factor in the design of the restaurant, added McGinn. The team’s mature attitude and respect for each other is key to their design process. “If you’re working in a group and working on competition work, it needs to be collaborative because you need the good energy to foster each other’s ideas. When someone is too controlling, you don’t get to see everything through,” said McGinn. “Someone has an idea, and you pass it on to the other person to work on. You have to get over having parts of your idea not in it,” added Mundle. McIntosh shared his experience with collaborative work in both the undergraduate and graduate level at the University of Manitoba.